Inventory and sales figures are tracked automatically by the software simply by entering customers and products, and recording seed movement and orders. As orders are entered into the system, SMS calculates product and discount totals and makes it easy to produce a professional-looking invoice. Math and inventory errors are virtually eliminated. For dealerships where support for affiliate dealers, multiple salesmen, and/or multiple warehouse-locations is needed, the multi-location option is available for both single- and multi-company versions. 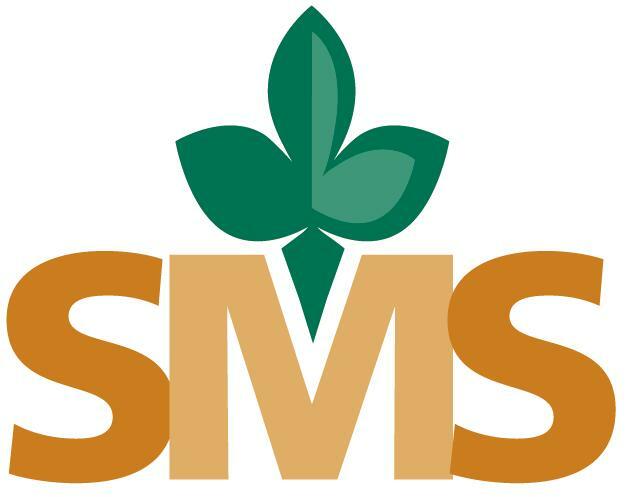 SMSuSingle-Company is designed for the seed dealer dedicated to one seed company. Because SMS was designed by a seed dealer, the system offers simple and logical operation while allowing the dealer the greatest control and flexibility to manage his business as he chooses. Information is available at the click of the mouse. The integrated help system makes it easy to get the most from SMS; simply press F1 for information pertinent to the current process. Easily accessible help system to "Learn as you go"
SMSuMulti-Company contains all the features of the single-company version but is designed for the seed dealer managing product for more than one seed company. Along with easy access to sales, customer, order, and payment information, SMSuMulti-Co offers ready access to inventory and sales information for an unlimited number of companies. 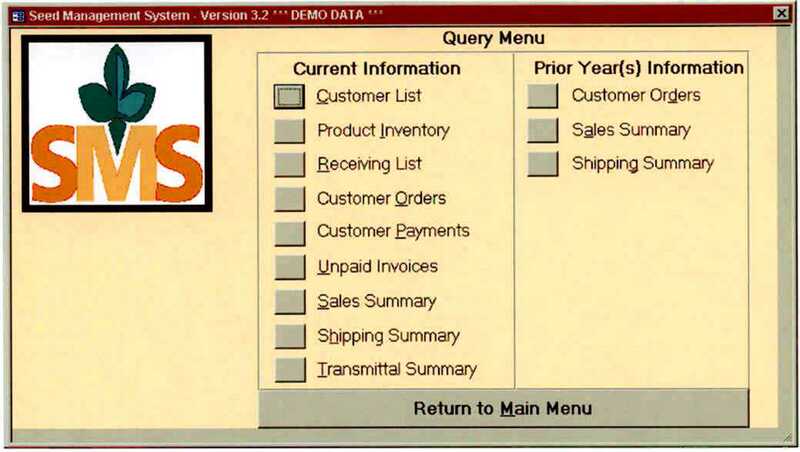 Information may be displayed for selected groups, as well as for the entire dealership. SMSuMulti-Co supports multiple cash-discount schedules that may be applied to orders for the individual companies. 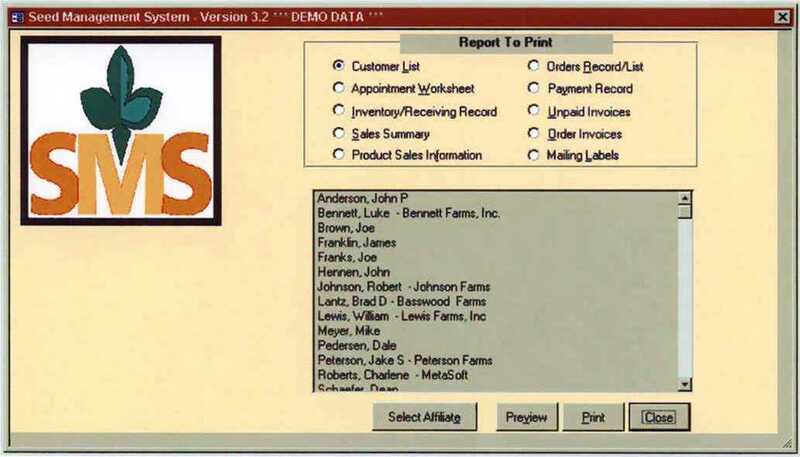 SMS gives the dealer the choice to print all invoices with the dealership's logo, or print invoices for each seed-company with the seed-company's logo. The set-up screen provides areas for company information, as well as dealer identification numbers for each company. The Multi-Location / Multi-Salesmen option is designed for the seed dealer warehousing product in more than one location and/or tracking sales by more than one affiliate dealer or salesman. As many warehouse-locations as needed may be setup with the capability to assign a location to an affiliate-dealer or salesman. Product may be received into and sold out of any warehouse, as well as transferred between warehouses with detailed transaction reporting available. Inventory and sales information are accessible for individual locations and/or salesmen, aiding in the control of inventory and year-end reconciliation. The multi-company version offers reporting capabilities for individual companies or for all companies in a single report.